If nothing else, the �90s alt-rock radio band Bush was a way for telegenic frontman Gavin Rossdale to plaster his mug on anything that stayed stationary for longer than a couple of seconds. Now, 900 years later, and Mr. Gwen Stefani is still making sure you know how good-looking he is: Zen X Four, a recently released DVD of the band on Dallas-based Kirtland Records, is pretty much just a sales pitch for Bush�s back catalog. The glorified tv commercial stars Rossdale�s cheekbones, leather chokers, and his ability to strum a Strat in the densest of forests. A majority of the DVD is made up of videos from the band�s 1994 debut c.d., Sixteen Stone, and they simply result in a so-so sequence of rudimentary, ambiguous art-house montages occasionally visited by slightly out-of-focus close-ups of Rossdale�s beatific visage. The element of confusion is presumably an attempt to whitewash the paint-by-numbers grunge that Bush pilfered from Nirvana and a slew of other Northwestern rock outfits. The trick doesn�t work. But a funny thing happened when the millenium arrived and we started tuning out Gavin and the boys: They kept making music and music videos � and some of the post-Sixteen Stone ones on Zen aren�t half bad. At this point, the group�s shtick was sort of coming into its own, primarily through the addition of industrial beats to the music and, to the videos, textured narratives. With spoken dialogue and an X-Files-ish plot involving murder and angel-winged humanoids, the �Greedy Fly� vid functions as a well-orchestrated short. Equally decent is the video for �The Chemicals Between Us,� which goes from gutter-bleak darkness to bright, Eastern-ish epiphany nearly seamlessly. The only problem is musical � while Rossdale certainly has a model�s good looks, he also has a stereotypical model�s brain. In the song, when he reaches into his bag of tricks to produce a profound statement, all he comes up with is clich�. The closer, �Letting the Cables Sleep� � about being in love with a deaf person (or something) � nails home the fact that Bush is about Rossdale and Rossdale only. Other than a glancing shot of the other three members somewhere in the middle of the DVD, you�d think the band was a one-man circus. The vid starts out coherently enough, with an underfed Rossdale getting it on with a hot deaf girl, but confusion soon asserts itself. The video could be an advertisement for black trench coats or an after-school special about the rigors of sign language for all we know. Though Bush had its time and place, and some of the band�s songs have some heft, Rossdale and company � like Duran Duran before them � were a video version of true rock �n� roll. They weren�t dangerous or original enough to breach respectability, but they were too pretty to be ignored. 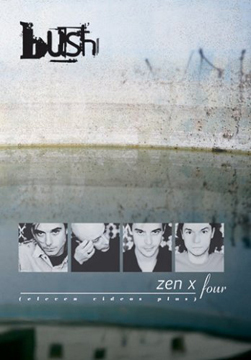 Simply put, Zen X Four is a one-time watch for people who may want to recall what they were doing in the late-�90s. (The accompanying audio c.d. is basically a live version of the band�s debut disc.) Bush is a reminder that no matter what you look like, this business we�re all part of is music, and the music still makes or breaks a band. The rest is as ephemeral as candy.